UPDATE: Our Motorola monitor died after about 1 1/2 years of use. Instead of chancing it on another iffy model that might not last, we decided to just get the best reasonably priced monitor on the market. 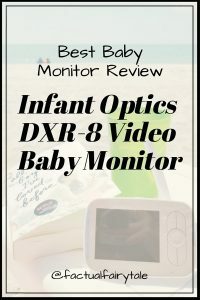 Read my Infant Optics DXR-8 Video Baby Monitor Review for a full look at the best baby monitor of 2019! We were shopping for video baby monitor around Black Friday. I had done a decent amount of research and knew we wanted one with a lot of features that we could use for a long time. I was looking at single camera video baby monitors and bought this one from Babies R Us with our registry completion discount. It arrived just in time for me to find this, more expensive, baby monitor on sale for the same price for Black Friday. I decided to buy both and see which had a better picture because I had read that the picture quality greatly varies from monitor to monitor and I wanted something easy to see and good quality. It never even occurred to me before finding the Motorola MBP38S-2 2-Camera Video Baby Monitor with 4.3-Inch Screen to get a 2-camera baby monitor. I mean, we have one baby, why do I need 2 cameras?! Well, I’m going to tell you why this turned out to be the best 2-camera baby monitor for 1 baby. 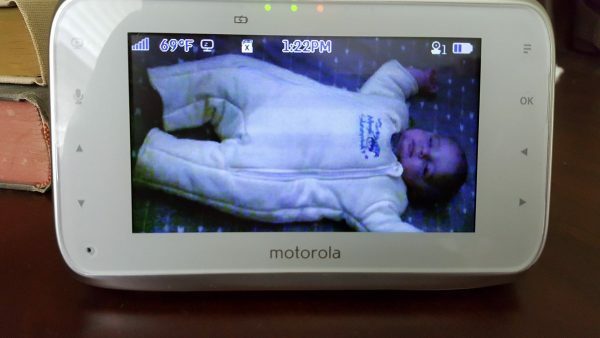 As I mentioned, we purchased two Motorola video baby monitors to try them out. 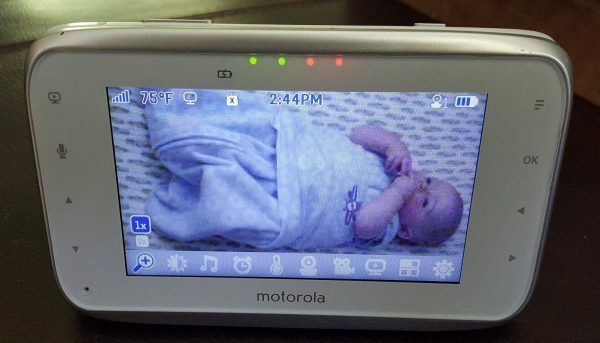 We ended up liking the Motorola MBP38S-2 Camera Video Baby Monitor with 4.3-Inch Screen because the image was clearer than the other Single Camera Motorola Baby Monitor. I had also gotten them for almost the same price so it seemed silly to not keep the better 2-camera system which was reduced from $220 to $140 on Black Friday. Well, it turns out getting the best 2-camera baby monitor was the right choice. Having the second camera to move around the house as needed is so convenient (and who doesn’t love convenient with a new baby!). We have one camera mounted above the crib where you can also pan to see the entire room. The second camera we use where ever it’s needed. For a while, we had it over the pack ‘n’ play in our room. Now it’s used in the living room for his swing or downstairs if we’re working on our screen porch renovation. 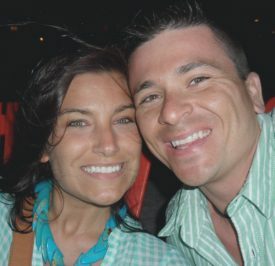 We also take the second camera with us when we visit family or go to the cabin. It’s so much easier than having to take down the camera in his room every day. Another reason we kept the best 2-room baby monitor option was that eventually we’d like to have another baby and we don’t want to have different baby monitor screens for each child’s room. This way, we can have a camera in each room and just switch back and forth as needed. With this baby monitor system, you can add in up to two additional cameras so if we still wanted an extra for around the house and on trips, we could purchase a third (or fourth) to connect to the same baby monitor screen. Awesome! That’s why this is the best 2-camera baby monitor for 1 baby or more! What’s the best 2-room baby monitor? The Motorola MBP38S-2 2-camera video baby monitor with 4.3-inch screen! 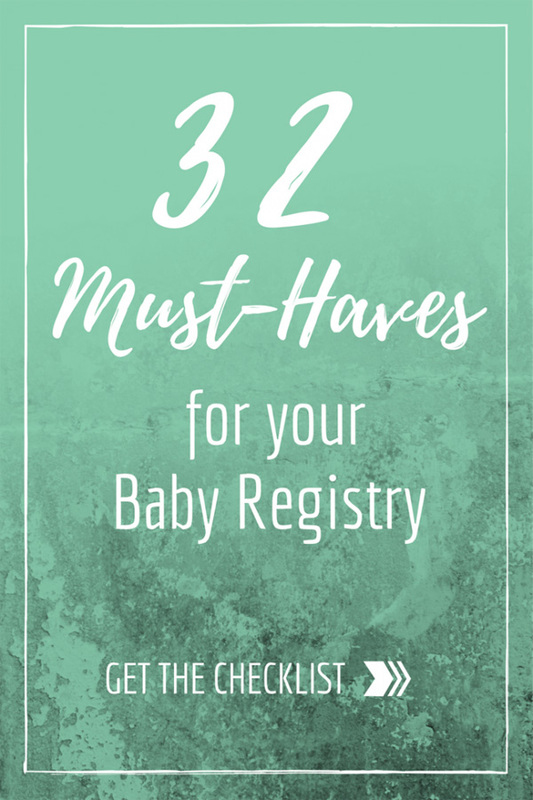 When I started researching the best 2-camera baby monitor I knew I wanted several key features that come in new baby monitors. The Motorola MBP38S-2 2-camera video baby monitor with 4.3-inch screen has them all! Remote Pan, Zoom, Tilt – Most important part of a video monitor. You want to be able to move the monitor around the crib and room and you’ll probably want to be able to zoom periodically. We can see the entire room with just one camera mounted on the wall above the crib. Long Range Baby Monitor – It’s one of the best long range baby monitors at 1000 feet! We can attest to the great range. We brought it to the neighbors for a few minutes at our cabin and we use it in all around our yard while doing yard work with no connection issues. It’s one of the best long range baby monitors I’ve found! Noise Level Indicator – It’s great to have a noise level indicator light on the screen because you can tell if the baby is fussing or crying without the sound on or while vacuuming, etc. We have a white noise machine in the baby’s room which comes through the monitor as static. If I’m writing a blog during a nap and I need it a bit quiet I’ll keep the sound off and just put the monitor right in front of me and check the noise level indicator (and screen) from time to time. You can see the green and red dots on the monitor picture below (it was playing music at the time). Two-Way Audio Baby Monitor – This two-way audio baby monitor allows you to communicate with your baby or partner from another room. With a young baby, we’ve found this most useful when giving tips on how to put the baby down. Friends have told us it’s very useful with toddlers who are trying to get out of bed, etc. One of the first things on the list when researching what to look for in a baby monitor. Room Temperature Display – We rely on this all. The. Time. Especially now that our babe is wearing the Baby Merlin Magic Sleepsuit which keeps him a bit warmer so we want the room a bit cooler. It’s so key to have this so you can make sure your baby doesn’t overheat which can lead to SIDS. Split Screen & Auto Switch Screen for 2-Cameras – We don’t use this feature now but once we have 2 babies we definitely will! A very important feature when you have more than one babe to keep an eye on. The 2 variations are awesome because you can watch both on a split screen or you can watch both via a rotating camera 1, camera 2 full-screen image. Day and Night Vision – Night vision baby monitors guarantee you always have a clear picture of your baby no matter the lighting. It automatically chooses the best vision for the room so you’ll often see it switching back and forth during nap times based on the sun coming in the room at the time. Clutch. Works with or without WIFI – This baby monitor offers both options which I like. I prefer to not use WIFI because it can be hacked easier and because WIFI is not available everywhere and cuts out periodically. We’ve never needed the WIFI option but nice to have if needed. Digital Signal – You want a digital baby monitor over an analog. Digital baby monitors stop others from being able to listen in to your child’s room. It’s a safety feature which makes it a must when deciding what to look for in a baby monitor! Out-of-Range & Low Battery Alert – Great to have especially when you’re working outside. This is the best long range baby monitor at 100 feet but even more, it alerts you when you’ve gone too far from the camera, the connection is poor due to a camera coming unplugged, or low battery. All very important since the whole point is to monitor the baby! Large Screen Baby Monitor – The Motorola MBP38S-2 2-camera video baby monitor has a 4.3-inch screen which is a lot larger than some of the competitors. The great part is, the hand unit itself isn’t huge, the screen is just really big. It can easily fit in my back pocket while gardening, etc. The kickstand props it up on the table when you’re relaxing and the large screen allows you to see if babes restless from across the room. Built-in Soothing Sounds & lullabies – Honestly, I didn’t even know this was an option until I started writing the blog (we’ve used it for 5 months….) and I’m so psyched! I was just thinking the other day how nice it would be to be able to play music when the mobile stops and he’s not asleep yet without going into the room. I fully intend to use this newly discovered feature ASAP! Two Cameras – As I mentioned, 2 cameras wasn’t on the must-have list until after I had both cameras. It became clear that having a 2-camera baby monitor for 1 baby was still key. Down the road when we have 2 children we’ll already have the best 2-room baby monitor. 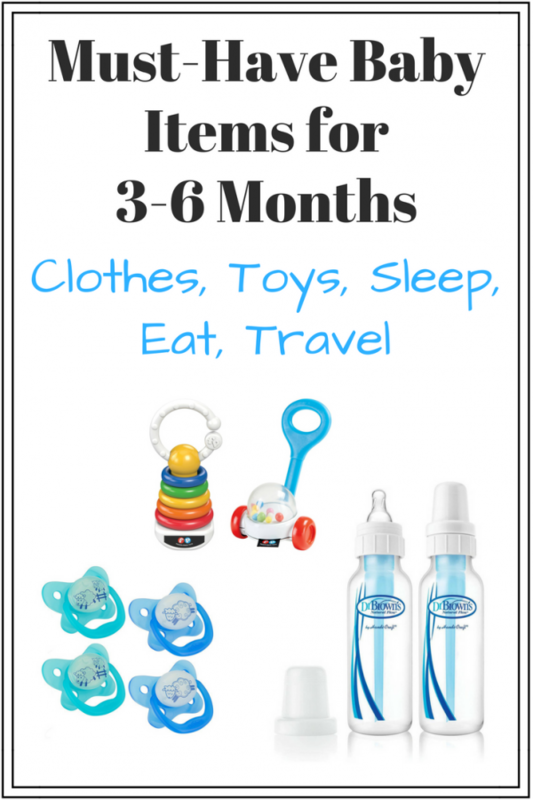 These were all things we found when researching what to look for in a baby monitor and they all come in the Motorola MBP38S-2 2-camera video baby monitor with 4.3-inch screen. I believe this is the best 2-camera baby monitor for 1 baby (or more) because of the features, quality, convenience, and ability to grow with our family. 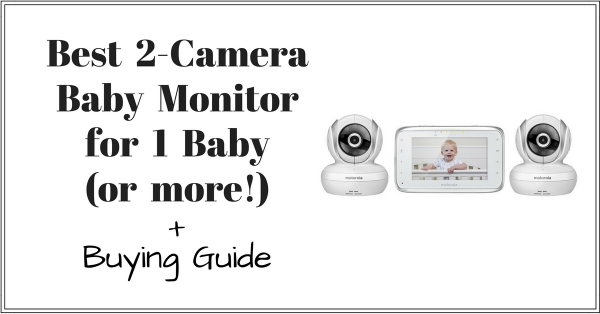 What do you think of my recommendation for the best 2-camera baby monitor for 1 baby? Do you have any additions on what to look for in a baby monitor? Share your experiences and tips in the comments below!